I first heard about Cleggett Wines from Australian television’s ABC Landline programme about two years ago when they showed Cleggett Wines of Langhorne Creek with their white, golden and bronze cabernet sauvignon. Ever since I have wanted to sample this rarity and hear the story behind it. Then I came across their name again while researching my article for Wine2030 on the University of Adelaide’s winery at Waite campus, as they make some of their wine there. At last, November 2010, I made the trip to see it for myself! 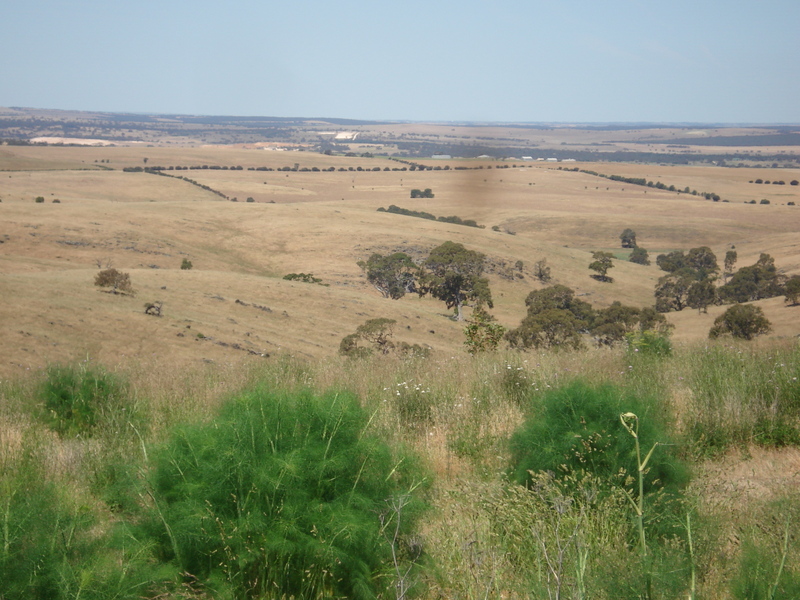 Driving down to Langhorne Creek from Adelaide on a sunny day in November, in the space of an hour the scenery and ambience notably changed. From a green lush Adelaide, the landscape took on a dried straw yellow hue, the traffic (and tailgating) subsided, and the speed limits relaxed – as did I. I drove through a sea of vines and avenues of gum trees, arriving in the small township of Langhorne Creek and immediately seeing a sign for Cleggett Wines. 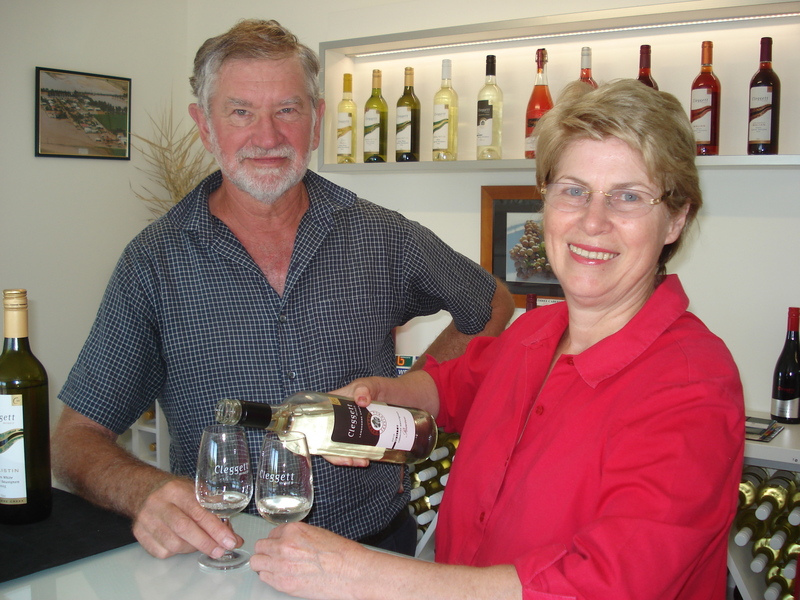 I had heard that Anne and Mac were friendly but they were so much more – welcoming, informative, generous in sharing their experience and knowledge – and their wines. Coming into their cellar door – just two years old, very tastefully and simply designed, and pleasantly cool – you immediately notice the row of wines on the wall behind the counter, with cabernets covering all colours in the wine spectrum from white to golden to rosé to bronze to dark red. A little background – Mac Cleggett discovered the bronze cabernet in 1977 – just on a single cane in their vineyard. This was propagated and registered as Malian. Then in 1991, white bunches were found on the Malian vine and propagated again to produce the Shalistin grape. The Malian and Shalistin grapes were named after members of Mac’s family. They are currently awaiting Commonwealth Government approval to have these grape varieties officially defined as bronze cabernet sauvignon and white cabernet sauvignon. They remain the only producers of these grapes in the world. These grape varieties have been studied over the years and it has been found that the Malian (bronze) grapes have a partial deletion of the anthocyanin (red/black colour), and the Shalistin (white) grapes have a total deletion of this colour – they are in fact albino. Mac told me that these varieties have benefits for the winemaker in having firm skins relative to traditional white grapes, and in having loose bunches. 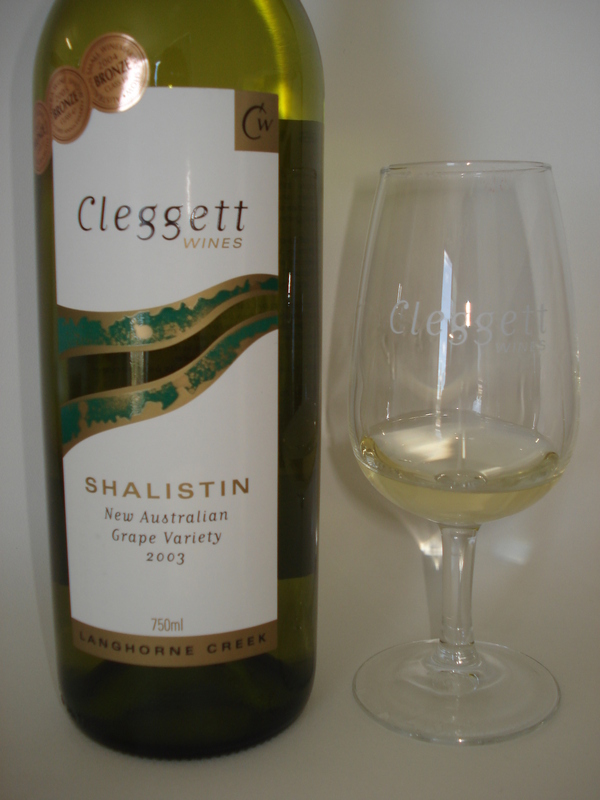 The 2010 Shalistin was a very pale wine with a slight yellow tinge. The nose was clean and fresh and gave me pears and Golden Delicious apples. The palate was so soft and velvety with the light fruit sweetness of apples and stone fruits, and the finish went on and on, gentle and soft and dry. The Reserve white cabernet sauvignon, picked three weeks earlier and from a different block, had all these elements with a hint of spice, bringing to mind an elegant NZ gewürztraminer – anyone who knows me knows that this is one of my all-time favourite wines. The Reserve White 2010 was chosen in The Adelaide Review Hot 100 South Australian Wines. I should mention at this point that these wines were extremely reasonably priced, mostly under $20, and the reserve only just over. The rosé was made from the Malian grapes – a pretty pink, it had a generous nose of candied apples and strawberries. The palate delivered a delightful explosion of fruit flavours and again soft and velvety with some elegant fruit sweetness, giving a long, dry, soft finish. I loved this wine! The cabernet that we are familiar with – the black grape – carried through the soft and velvety theme. On the nose it was a delicious medley of chocolate and dark berries, in some ways a typical cabernet but not quite like any I had ever tried. The tannins were just right, and the palate long. For anyone who has not visited this winery I would give them a huge endorsement. An immensely friendly and genuine couple, they shared experiences and stories with me and were generous in telling me about their wines and in letting me try them all and take lots of pics! 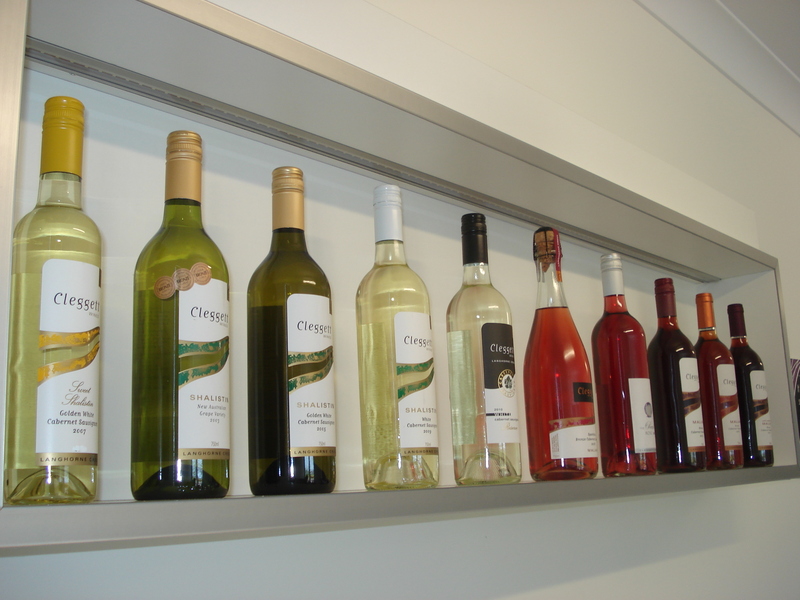 The wines are unique and fabulous value. I will certainly be back. In the meantime, I shall be taking a bottle of their Pearl Rosé to upcoming Christmas parties – if you’re quick enough I’ll even share! 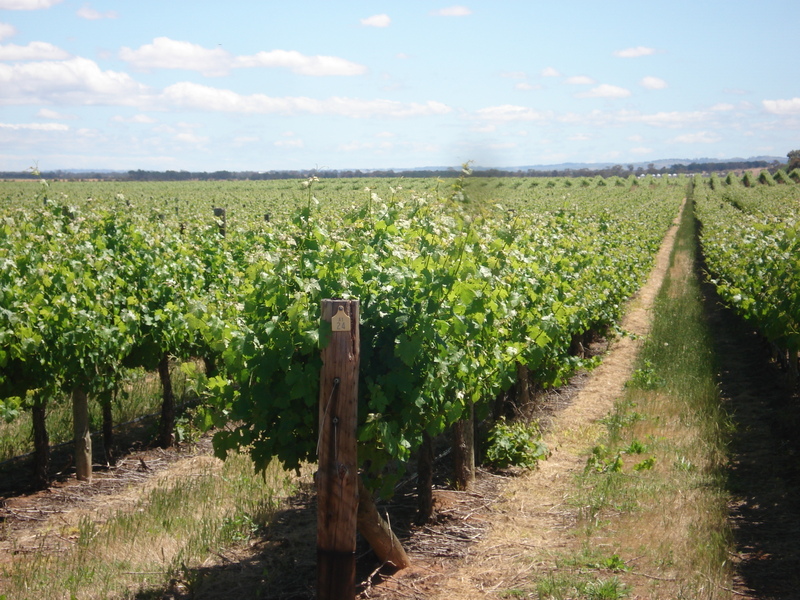 This entry was posted in Cabernet sauvignon, Langhorne Creek wine, New World wine, South Australian wine, University of Adelaide’s Wine Sciences Laboratory at Waite and tagged Australian wine, cabernet sauvignon, Langhorne Creek, South Australian wine, University of Adelaide, Waite, white cabernet sauvignon, Wine, Wine2030. Bookmark the permalink.